Now that harvest time is over and the cold is starting to settle in, we are spending more time indoors and are also retreating inward, looking inside ourselves a little deeper. The dark months are a time of reflection. Now is the time to draw back, “hibernate” and think about our lives, our paths and ourselves in general. Harvest isn’t just the actual bounty of the earth but also a harvest of our own achievements and experiences, both good and bad. Winter is the ideal time to have a good look at what we have created in our lives, spread it all out and contemplate it. Winter is also a great time for cleansing of our homes, minds and bodies. This working is very simple and appropriate for the coming dark months. To signify your willingness to move on and let go of things, first do a really thorough cleaning of your home. Go through your closets and cupboards and donate anything you no longer need. Keeping “stuff” signifies that you may also hang onto emotional baggage. Break out the duster and tackle every nook and cranny – don’t forget on top of picture frames and the ceiling fan! When the snow falls, go outside and gather some in a jar. Your jar can be as plain or as fancy as you like. You can use one that appeals to you based on color or shape, or simply because it had your favorite wine in it. Just make sure it has a screw top and closes firmly, because you don’t want it to leak. Let the snow melt in the jar, until the jar is full of water, all of it straight from the sky itself. 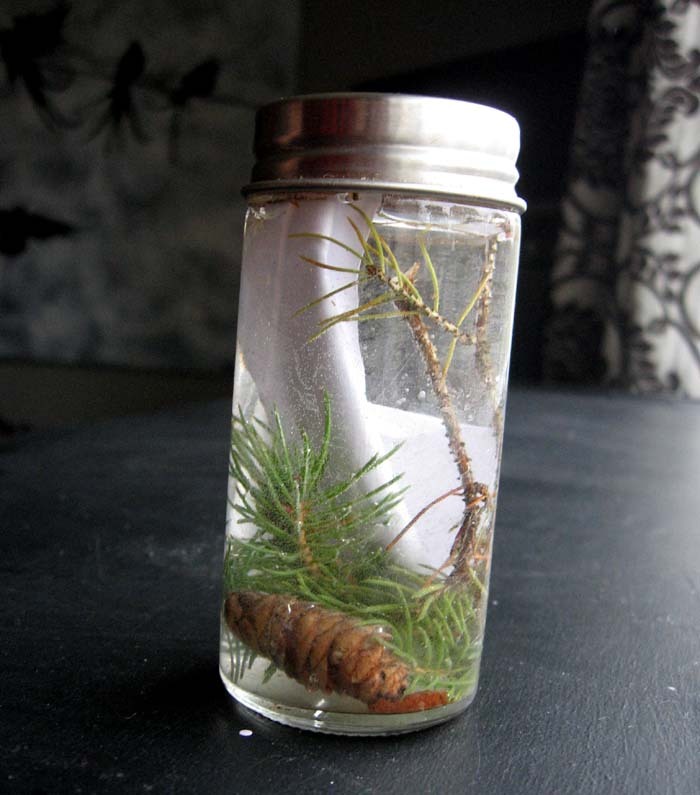 Add a handful of fresh pine needles to your jar or bottle of rain. Pine is said to have cleansing, purifying properties and is easily found around your home or in a park. Other herbs to consider are lavender, mint or sage. Close the bottle and let it sit in a window where it will be exposed to both daylight and moonlight for three days and nights, to cleanse and empower it by the sun and the moon. Find some quiet time when you will be alone and uninterrupted. Light a white candle and if you like, cast a circle or call upon deities. Have ready a piece of thin newsprint paper and a pen. Think about your long term goals, as well as things that you would like to change. Consider your experiences from the past year, and what you have learned from them. Has anything happened that you need to let go of, such as old hurts from others or guilt upon yourself? Perhaps there are situations you wish turned out differently that are still weighing upon you, or you are hanging onto some resentment. Whatever it is you’d like to change or get rid of, write it down on the newsprint. Some examples are healing a broken heart, overcoming shyness, breaking bad habits and addictions, or forgetting about someone who has wronged you. Purge all of this out of yourself onto the paper in your own words or pictures. See yourself as free and clear of these issues. Then roll or fold the paper up, put it in the bottle and recap it tightly. Next year on the same day retrieve your bottle. Shake it up and see how the paper has changed form, perhaps into mushy nothing. Have the long-term nasties you put onto your paper also deteriorated or changed, at least somewhat? Even better is if you’ve forgotten what you’d written at all, the problems have been solved so successfully. At this point, dump the contents of the bottle into a lake or river and then send the bottle to be recycled. Don’t keep it. Think about the positive changes you have made in a year, how things have progressed, and how far you have come. Then walk away and call it done.